Corgarff Castle stands in a wild and lonely spot at the head of Strathdon. Head due west from here and the next road you reach is 20 miles away at Glenmore, near Aviemore. And en route you will have crossed the high northern slopes of the Cairngorm plateau. 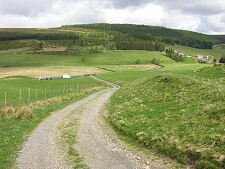 Through much of its history Corgarff has been of strategic importance, guarding the quickest route from Deeside to Speyside, a route later followed by the military road from Blairgowrie to Fort George. Its location ensured that Corgarff Castle has had an eventful and sometimes tragic history. The castle is thought to have been built in about 1550 by John Forbes of Towie. It would initially have comprised a tower house set within a walled enclosure. 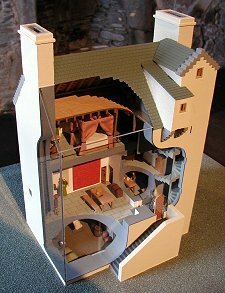 The tower house would have been similar to the structure you see today: the surrounding wall would have been very much simpler and probably rectangular in plan. The Forbes family were supporters of the cause of the infant James VI in the years following the imprisonment of Mary Queen of Scots in England (see our Historical Timeline). The Gordon family from Auchindoun Castle near Dufftown were supporters of the claim of Mary to the Scottish throne. 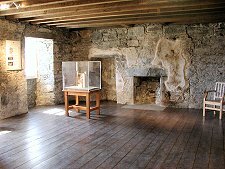 This led to feuding between the two clans, and in November 1571 Adam Gordon of Auchindoun Castle tried to capture Corgarff Castle. The Forbes menfolk were absent, but John Forbes' wife, Margaret, refused to surrender the castle and shot one of Gordon's men through the knee with a pistol. 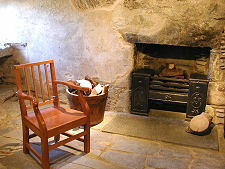 In response Adam Gordon piled kindling against the castle and burned it down, killing Margaret Forbes and the 27 other women, children and servants who were inside. It is perhaps not surprising that the castle is believed to be haunted. 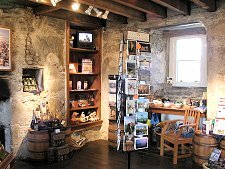 In 1607 the castle was taken over as a base for local bandits who plundered the surrounding area until 1626 when it was acquired by the Earl of Mar. 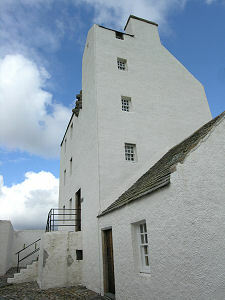 In 1645 Corgarff Castle's strategic location again came to the fore when it was used as the mustering point by the Marquis of Montrose, commander of the Royalist forces in Scotland during the Civil War. And during the 1689 rising led by Viscount Dundee, Corgarff was again burned down, this time by Jacobites to prevent it being used as a base by supporters of William of Orange. 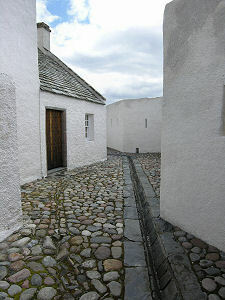 In 1715 Corgarff once again played an important role in national events. The 23rd Earl of Mar launched the Jacobite rising from Kildrummy Castle, further down Strathdon. He then came to Corgarff to assemble and equip his army before marching on to Braemar. After the 1715 rising had been defeated, Government forces yet again burned down Corgarff, and the Earl of Mar's estates were forfeited. The castle was then returned by the Government to the Forbes family. But 30 years later it was caught up in the maelstrom of Scottish history again. In early 1746, Jacobite forces were using Corgarff Castle as an arms store after their retreat from Derby. A forced march by 300 Government foot soldiers and 100 dragoons through the snow from Aberdeen caught the Jacobites off guard. When the troops arrived the Jacobites had fled, but so hurriedly that there was a cat asleep in front of the still burning fire. 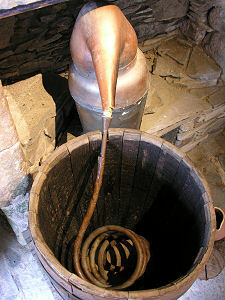 The troops also found large quantities of gunpowder and over 300 muskets, which they either destroyed or took back to Aberdeen. The Battle of Culloden, which took place some weeks later on 16 April 1746, was so one-sided that the loss of these weapons by the Jacobites was probably not decisive: but it can have done little to help their morale. The Corgarff Castle you see today owes much to events following the 1745 uprising. In an effort, either successful or unnecessary, according to your point of view, to suppress the Highlands once and for all, the Government stationed outposts of troops right across the country. 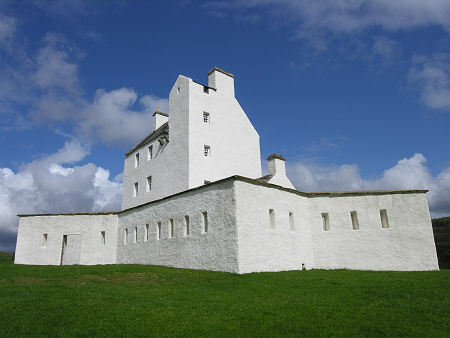 In 1748 Corgarff Castle was converted into barracks. At the same time it acquired the flanking pavilions you see today and a very unusual star shaped encircling wall shared only - as far as we know - by Braemar Castle, which lies some 12 miles south west as the crow flies. 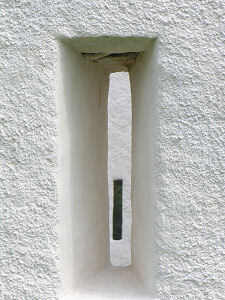 The outer wall was well equipped with musket loops, but it is obvious from the design that attack by artillery was not expected. In the event, these defences were never tested. 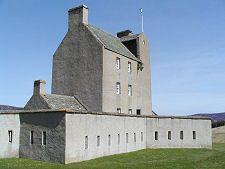 Over the following years, Corgarff Castle was used as a base for around 50 men under the command of a junior officer. Half would have been quartered in the castle itself. The other half were divided into small and widely scattered patrols and based in a variety of barns or in the homes of the largely hostile population. They spent much of their time chasing highlanders unwise enough to wear their kilts (which were made illegal in 1746), carry weapons, or smuggle whisky within view of the troops. 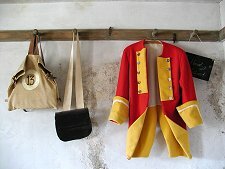 Life in the barracks would have been comfortable in terms of 1748 expectations. But when looking round the recreated barracks at Corgarff, remember that the beds, which look generously sized, were intended to be used by two soldiers. 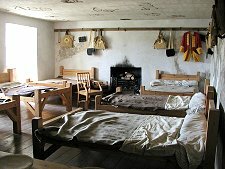 And although it would not have happened at an outpost like Corgarff, in a larger base like Fort George up to one in a hundred soldiers was allowed to marry, and his wife and any family would also live in the barrack room. So while you peer out of the upper floor window at the lovely views over Strathdon, think how it would have looked to a soldier in winter, amid a hostile population and a very long way from home. 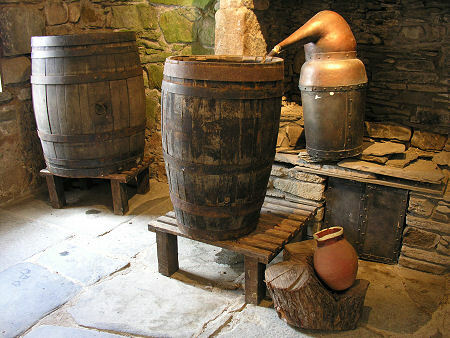 From 1802 the Castle was used as a farmhouse, but the Government repurchased it in 1827, this time as a base designed specifically to tackle whisky smuggling and illegal distillation in the area. From the army's final departure in 1831, the castle went into a steady decline. Its last residents were the Ross sisters, known locally as the Castle Ladies, and they left during the First World War. 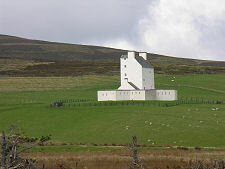 Corgarff Castle passed into State care in 1961 and has since been restored by Historic Environment Scotland as it would have been in the years following the 1748 conversion. The most recent change has been replacement of the old grey finish with a layer of strikingly white harling which, if nothing else, certainly allows Corgarff to stand out from its surroundings.